This classical guitarist plays stunningly beautiful music for all types of event, as appreciated by Gok Wan, Champneys, and several A-list clients for weddings, birthdays and any celebration or event imaginable. Based in the south east of England, this guitarist plays regularly in London and the home counties, as well as further a field, including the United States, Canada and Asia. A large and varied repertoire is available from classical and romantic, to popular, jazz, Latin, Spanish and traditional. Any special favourite tune can always be accommodated for your ceremony. 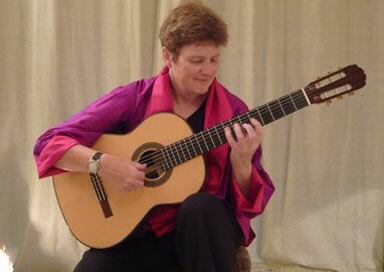 With a wealth of experience and willing to travel any time and to any place for clients, this guitarist has performed in literally 100s of concert halls, churches, country houses, corporate functions, private homes and gardens. Some of the more unusual locations include the thirteenth century castle ruins at Hadleigh, and the active volcanic slopes of Mauna Loa, Hawaii, and (arguably) Europe's top location, the viewing platform of the London Shard! For a warm intimate atmosphere, and for larger events, subtle amplification is applied. “... altogether an artist, who we are looking forward to hearing again." Anna uses light amplification unless requested otherwise, but can supply a self powered amplifier by arrangement, where no mains power supply is available.